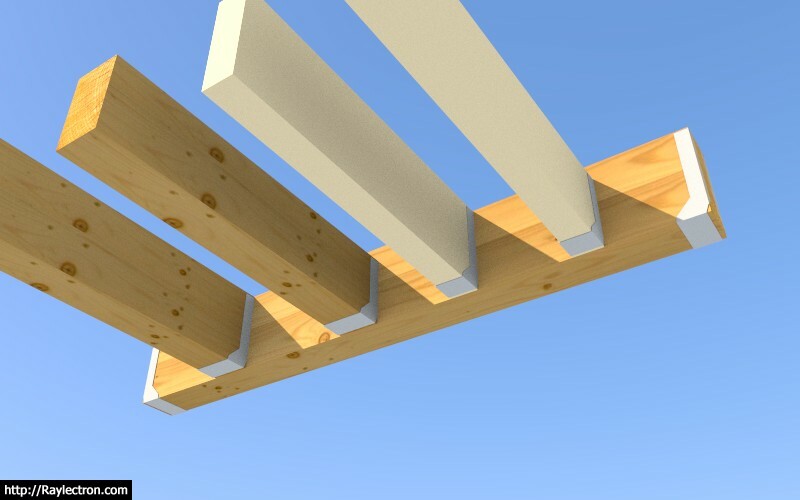 - Steel: Wide Flange (W) beam types added to the beam module. I've only added five wide flange sizes thus far. I just need to know what sizes are most typically used and I can add them in. Note that miter and fire cuts work with the steel beams as well. 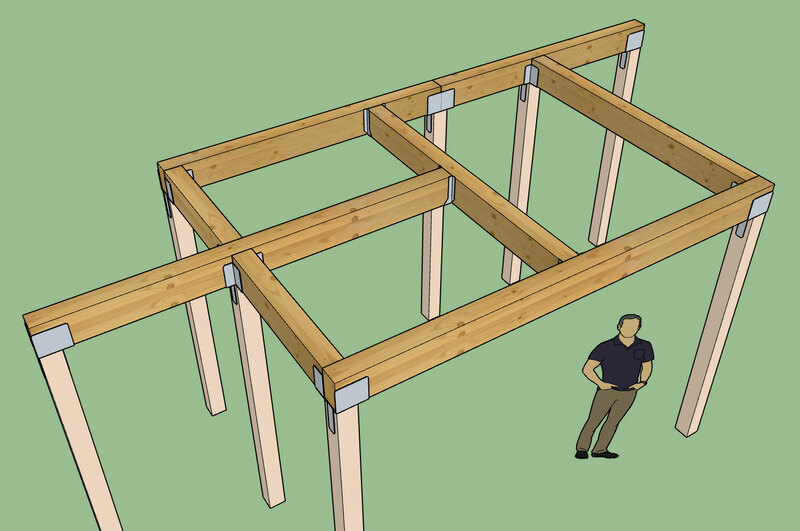 I was also thinking an advanced option for steel beams might be a nailer plate on top and/or bottom of the beam, again feedback in this regard will determine if I pursue this further. - Added a hanger library (customizable) and the ability to place hangers at the start and/or end of a beam. The hanger library is located in the "hangers" sub-folder of the library folder of the plugin. I have a few Simpson Hangers included but any of these can be modified and additional SKP files can be put into this folder. 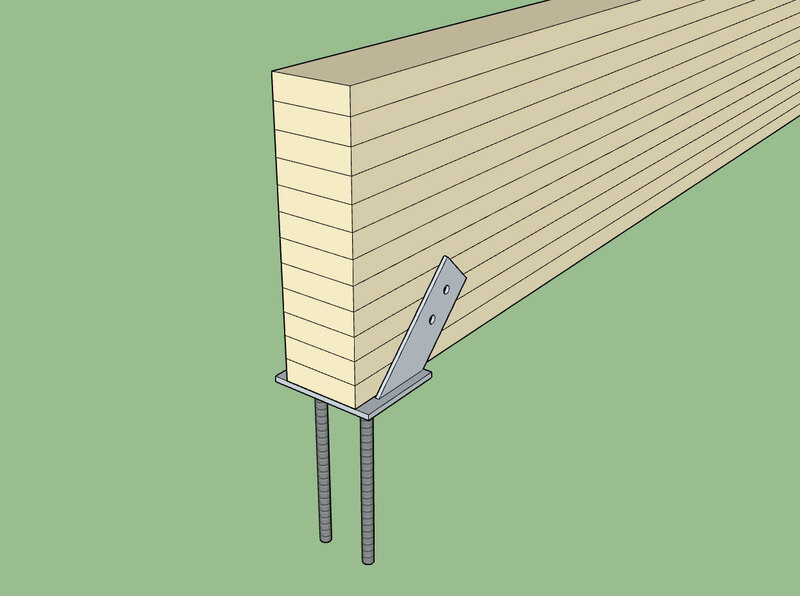 The plugin will automatically allow the selection of any components found within this sub-folder when selecting hangers for beams within the draw and edit menus. 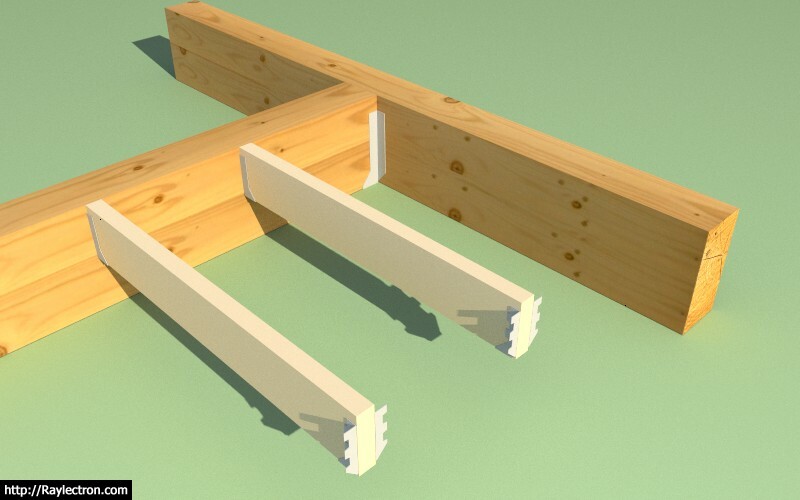 I have contacted Simpson Strong-Tie in an effort to get a few more of their more common hangers that I can then simplify and include in the plugin. I am particularly interested in the HUCQ series. In order to minimize polygon count I typically eliminate most of the holes in the hangers and also any curved surfaces, the goal is to keep the file size below 50 kb if possible. It was as simple as dropping the files into the folder, no coding required. The parametric ability to change the "hanger" at each end is vital when setting something up like this. Not saying you would actually build this but I've worked on some local designs with complex porches that easily rival this monstrosity. I will roll these components into the hanger library on the next sub. revision, probably tomorrow. - Created a number of low polygon count Simpson Strong-Tie hanger and column caps. Any hardware included with the plugin are custom drawn by me to reduce polygon count and standardize layers and materials. If you would like to see specific hardware added please email me the manufacturer, part numbers and reference material. For Simpson hardware I typically refer to their literature and their various DWGs files found on their website. Changing gears from exterior trim to gable walls you can see in the image below that a symmetric gable wall with equal wall heights and equal pitches is only the tip of the iceberg. In the example below the pitches are equal but the start and end wall heights differ by four feet. One could also have different roof pitches so the pitches may differ as well. 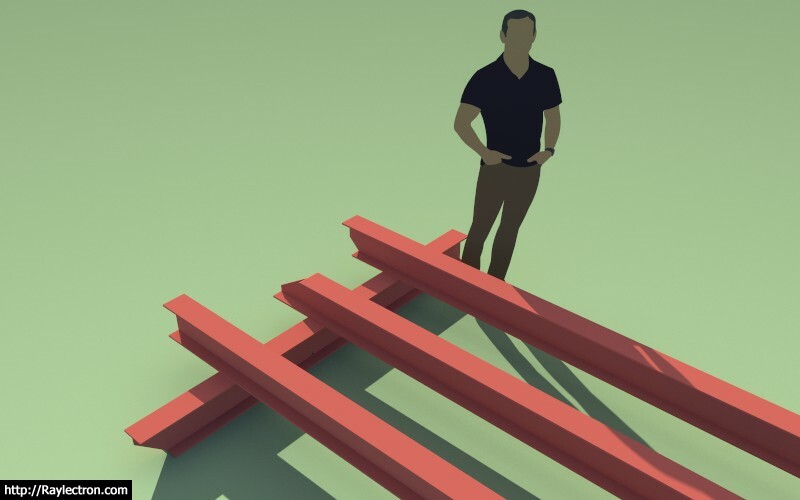 Theoretically one could draw a scenario like this with two "shed" wall panels butted up to each other except for the problem that the door would bisect this wall junction, hence it must be drawn as a single wall panel. Also note the double stud placement at the pitch break. This may not be typical for all builders but I would recommend this more conservative approach rather than a single stud at the pitch break. Looking at this wall segment it occurs to me that wall panels that connect to this panel at the corners or tee into it cannot be treated the same way rectangular wall panels connect with lapping top plates. Again, things just got a little more interesting. Please feel free to add to this list. I believe the first three of this list are the highest priority. The band thru corner parameter causes the band board to cut through the corner trim boards and extend all the way to the corner (mitered). The four additional parameters should be sufficient to fully define the band board. The band board trim thickness is the same as the corner trim, I'm assuming that typically you would want these various trim boards to all be the same thickness? If not then an additional parameter for the band board thickness is required. By the time I add in all of the parameters for the frieze and water table the menu is going to get quite large, which can create problems for people working on laptops with small screens. My only option at that point is to remove some variables from the draw wall tool ext. trim menu (still available in the global settings and wall edit menu) or go to an HTML menu. June has been a very active month, as documented by the changelog. There is still a lot more to do and some small fires still exist so July should also be relatively busy month as well. Wrapping up some loose ends and fixes are on the top of the list as is the gable wall module. 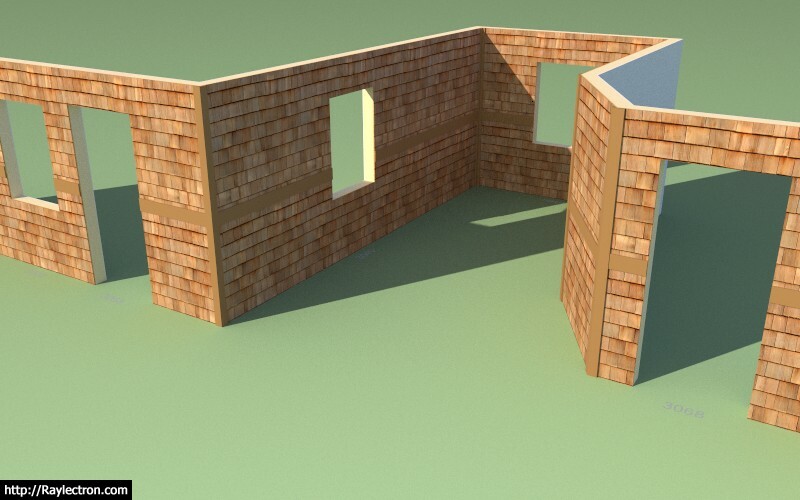 Fortunately, a lot of code for this new module will be recycling of existing code but due to the complexity of gable walls it will probably take a couple weeks to really pull it all together. From a marketing stand point I am a little concerned with the interest level in the plugin. I fully expect that the actual purchases of the plugin will still be low since it is still in a beta stage however I am surprised that more people are not at least downloading the plugin and trying it out. This is cause for some concern. Any thoughts on lethargic response would be helpful. I am always open to changing direction or marketing strategies if common sense or certain factors dictate it. I apologize if the plugin is "too deep" for some, my intent is not to overwhelm or even over complicate things. Unfortunately, buildings are complicated structures and as my previous post on exterior trim has shown even fully defining a sub-system within a structure can get a little crazy at times. To be perfectly honest, a couple months in and I've only really scratched the surface. The engineering and estimating and auto-layout modules are stilling waiting in the wings. I don't think my pricing is too high or asking to much, but I realize it might still be a bit to bite off for some considering the current developmental state of the plugin. I guess what you have to realize is that you are not paying for two or three months of coding you are actually purchasing everything I've done up till now plus two more years of full time development. So I do think it will be good value for the money. 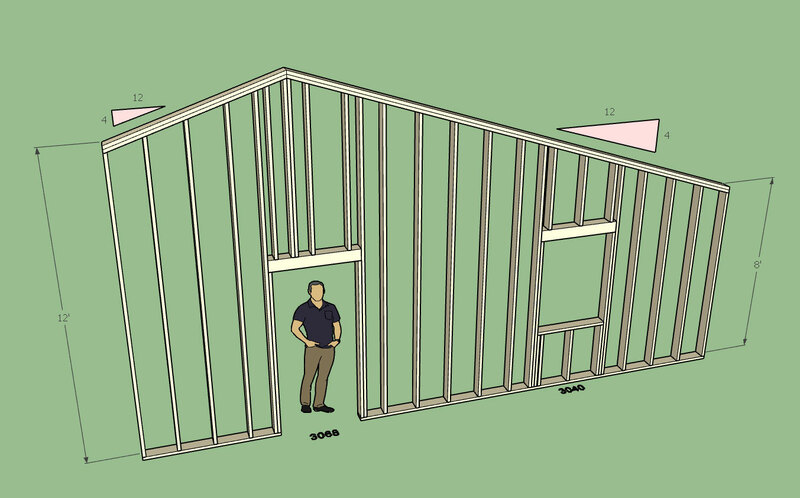 I also realize that the SketchUp community has a slightly different mentality than the rest of the design world. We are used to a lot of quality plugins and even the SU software coming at no cost or a greatly reduced cost when compared with other drafting/design software and tools out there. We are hesitant or unwilling to accept subscription type licenses (myself included). With all that being said perhaps a different business model would meld better with the SU design community. Any thoughts in this regard would be greatly appreciated, please send your comments directly to nathan@medeek.com. 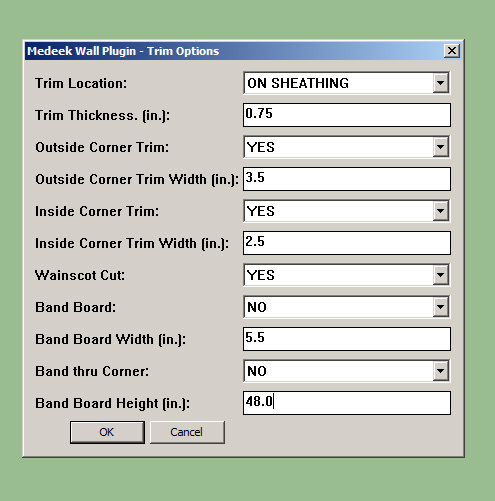 - Added a band board option to the exterior trim module. 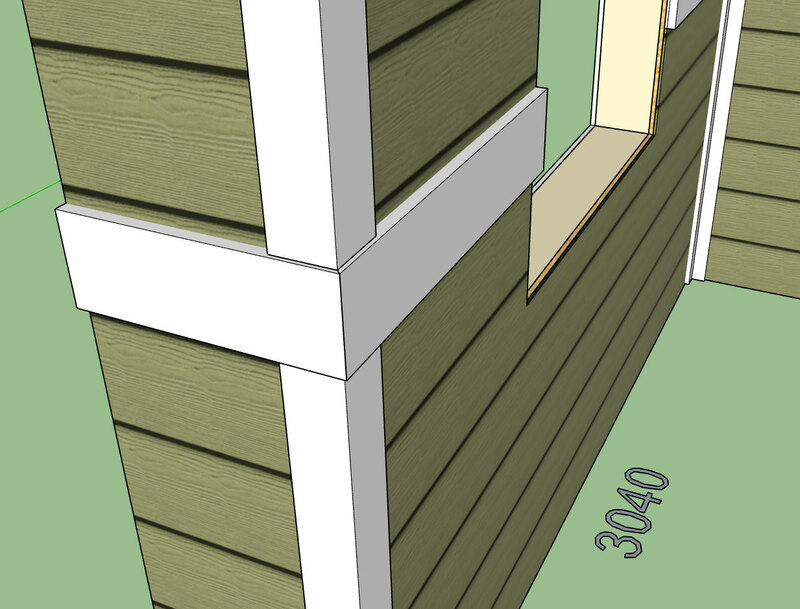 - The "band thru corner" option allows the band board to cut through the corner trim. 1. When drawing walls with Advanced=Off, the walls appear as they should, and I am able to continue from the end of the previous wall with drawing my walls. When I invoke the Edit Wall Assembly command, the configuration menu appears, I turn on Advance, work my way through the cladding, etc., and then click on update. Nothing happens, no changes are made to the selected wall. I also clicked on Save Preset, entered a new name, then closed the Edit Menu. When I reopen the Edit Wall command, in the drop down at the top I select my preset, click on Load, then Update and again - nothing happens. 2. When drawing new walls with Advanced=On, and working my way through the various setting, then starting to draw my walls, the first wall is fine. However, the second wall starts from the same place as the first wall no matter which direction I attempt to go. The walls simply pile up on top of each other. I have attached a screen shot showing the cursor behavior. This occurs whether I have selected “Line” or “Polyline” in the menu. If I terminate drawing the wall, then re-invoke, no matter which point I select the wall is drawn from the origin point of the first wall in the project. This all worked before, so I am unclear on what to do to fix it. Before installing the latest update, I did uninstall the previous version using the Extension Manager, and then close and reopen Sketchup, install the new version using the Extension Manager, then proceeded to use the plugin. Can you turn on the ruby console and then copy and paste the error codes. I'm not seeing any errors on my end but my settings may be slightly different than yours so I need to be able to duplicate the error in order to fix it. The error codes will point me in the right direction. I set the trim color to #ffffff. What do you get if you just leave the trim color as default? I'm not exactly satisfied with the way I have the whole material/texturing thing setup with assigning colors etc... I think it might be better to just go with a user definable SKM library instead so that the designer/user can provide their own colors and materials, thoughts? I've been thinking about moving to an SKM based user library for material selection and assignment. The only problem I see with this is that it would require SketchUp 2017 or newer so it would effectively end my compatibility with older versions of SU. Re: your color question - when I load the menu there is no default value in the box for Trim color and the behavior is the same for me whether there is a value in the field or not. I entered the #ffffff just to have something in the field to investigate whether that would affect the behavior. It did not. Just weird as it worked well in the last iteration. I am not sure what a SKM library is. I guess I am not that advanced. For me just being able to reliably define a color in the Advanced menu would be fine. I think that white is a good default color for trim and one that I use all the time.